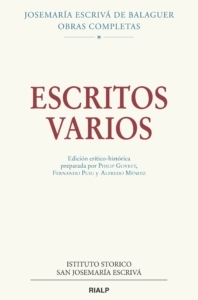 The Istituto Storico San Josemaría Escrivá de Balaguer has just published a book that brings together a collection of texts by St. Josemaría. The texts are taken from various sources. The book, which is entitled “Miscellaneous Writings”, has been published by Rialp. This is a critical-historical edition of eleven short items – articles, interviews, papers delivered at congresses, conferences and homilies – that St. Josemaría prepared for publication over a time span of almost fifty years, between 1927 and 1974, and which until now have been scattered and difficult to locate. Their heterogeneous character is in perfect harmony with an underlying unity in which the author’s personality may be recognized. In the words of Msgr. Fernando Ocáriz, in the book’s prologue, “this variety offers a rich mosaic of the spirit of the founder of Opus Dei”. 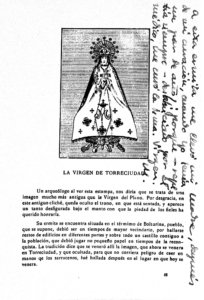 St. Josemaría’s annotation on an old prayer-card of Our Lady of Torreciudad: “My mother took me to this shrine after I was cured when I was two years old: because – she always repeated – after having been written off by the doctor, the Blessed Virgin cured me. M”. The various texts have been organized into four sections, each with its own introduction: The first, Homilies on the Church and the Priesthood, features three homilies published in the final years of the author’s life; the second section, Juridical-Canonical Writings, includes an article from 1927 (the very first publication by St. Josemaría), a 1948 conference, and a paper presented at a congress held in Rome in 1950; the third section entitled Articles and Interviews, includes an article from 1969 and two interviews; the fourth section, Marian Writings, contains two articles on Our Lady of El Pilar published in the 1970s. The publication, which was edited by Philip Goyret, Fernando Puig and Alfredo Méndiz, includes a prologue by Msgr. Fernando Ocáriz, prelate of Opus Dei, and concludes with an onomastic index and a section with facsimiles of some documents and explanatory photographs. In all, the volume contains 344 pages. Philip Goyret (EEUU, 1956) is an industrial engineer, a priest and he holds a Ph.D. in Theology. He lectures in ecclesiology and is dean of the Faculty of Theology at the Pontifical University of the Holy Cross. He is also Rector of the Church of San Girolamo della Carità in Rome. Fernando Puig (Terrassa, 1968), is also a priest, he holds doctorates in Private and Canonical Law as well as Dogmatic Theology. He lectures in Church Organization and Government and he is vice-dean of the Faculty of Canon Law at the Pontifical University of the Holy Cross. Alfredo Méndiz (Barcelona, 1960) holds a doctorate in history, is Assistant Director of the St. Josemaría Historical Institute, and is the author of several publications on St. Josemaría and the History of the Church.